China is urging neighbor Japan to work with regional powers to resolve the current crisis on the Korean Peninsula and not resort to unilateral actions with the help of outside parties. Foreign Ministry spokesperson Geng Shuang told reporters on Monday that Beijing is concerned about reports that Japan will follow South Korea’s example and install the US missile defense system, Terminal High Altitude Area Defense (THAAD). “We hope Japan [will] play a constructive role in boosting regional peace and stability, not to the contrary,” Geng said. 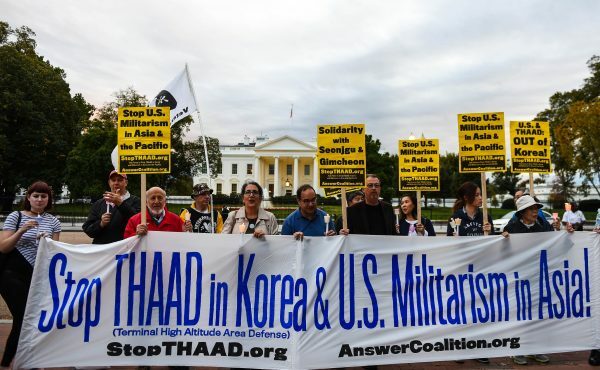 Both China and Russia have also strongly criticized the US decision to deploy the THAAD weapons system in South Korea saying it will ignite a weapons race in the region. The Terminal High Altitude Area Defense system, or THAAD, is a response to Pyongyang’s recent ballistic missile tests, South Korea and the US – and now Japan – say. Last week, Japan and South Korea inched closer to signing a military intelligence pact to thwart threats from North Korea. According to Japanese media quoting South Korean military experts, Tokyo will provide satellite imagery and intelligence about North Korea’s transporter erector launcher (TEL). In exchange, South Korea will supply Japan with highly classified information about the North’s missiles detected by long-range air search radar. Under this accord, titled the General Security of Military Information Agreement (GSOMIA), Seoul and Tokyo will share intelligence on security in the region. Russia and China must consider establishing a joint comprehensive air and sea and land missile defence system crucial to offset the threats caused by Thaad missiles in South Korean and Japan led by the US for now and future. In addition to having strategic defence missile systems, the two countries should work together to upgrade its offensive weaponry capable of launching overwhelming attacks with maximum strike capabilities on any intended targets no matter who, what and where they are as a matter of urgency and in case of war. Such offensive weaponry must include advanced strategic nuclear weapons.